We are pleased to announce that the Academic Libraries of Indiana (ALI) Archives collection is now available in the Digital Media Repository. The collection consists of organizational documents, Board of Director’s records, membership documents, Information Literacy Committee materials, Resource Advisory Committee minutes and reports, Resource Sharing Committee documents, and news releases. For more information about ALI, visit http://ali.bsu.edu/. We are pleased to announce the Indiana Bridge Company Collection as an addition to the Digital Media Repository. 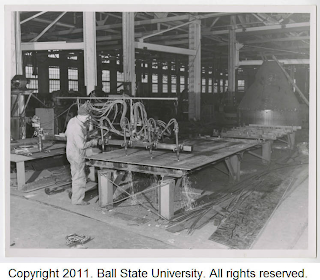 The collection contains materials from Archives and Special Collections and from the Drawings and Documents Archive, including drawings, photographs, and documents from 1886 to 1981, documenting the work of the Indiana Bridge Company that was headquartered in Muncie. The company built thousands of steel structures through Indiana and around the country. The William Henry Jackson World’s Columbian Exposition Photographs is a new collection in the DMR. 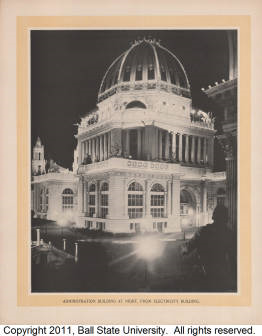 This collection consists of images from two books of plates, White City and Jackson’s Famous Pictures of the World’s Fair, that are images taken by the famous photographer William Henry Jackson for the 1893 World’s Columbian Exposition (aka Chicago World’s Fair). Jackson was famous for photographing the America’s westward expansion.